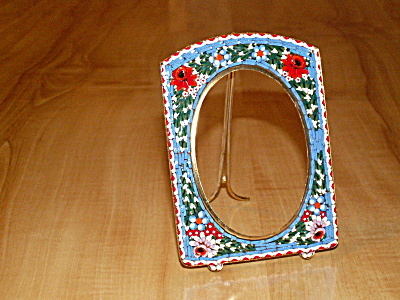 Antique Miniature Micro Mosaic Tile Picture Frame Floral Brass 4 In. 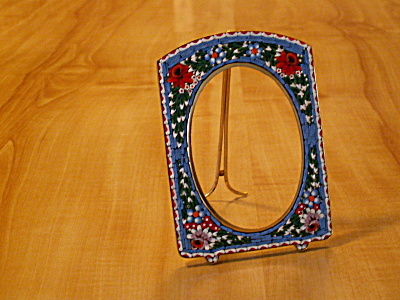 Eye-catching small antique picture frame which came out of a home. Uses micro mosaic tiles which we think are pieces of glass. Multi-colored bits arranged in a striking floral or flower pattern set against a rich medium blue background, with red & white trim. The entire design is assembled from these colored tiles, cut to fit into the tiniest pieces, a true work of art. Largely rectangular shape with curved top edge and two small curved feet at the bottom. 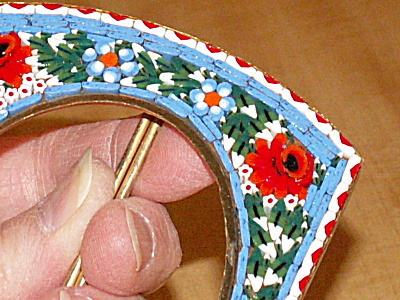 The tiny mosaic pieces are all set into a brass base piece that has a leg attached on the backside, permitting it to stand. 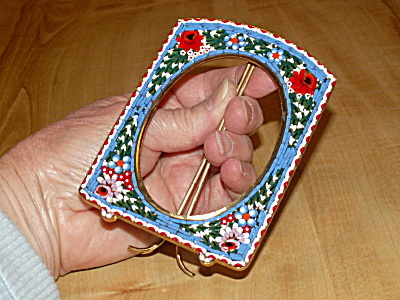 Measures about 4 1/4 inches greatest height x 3 inches width. This older frame weighs a little over 2 1/2 ounces unpacked, and will be shipped in a box for safety. 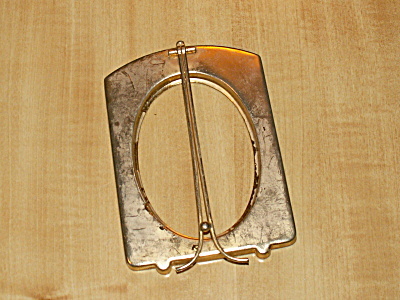 What is key to note here is that the original oval glass cover (for a photograph or picture) and the oval brass back piece which would hold this in, are not present. This is how we got this out of the home, so the prior owner must have lost or broke these 2 pieces. Perhaps someone has another similar frame from which these could be taken, or a crafty person could find a way to still insert a photo and hold it there.....but you need to know that in this case only the main frame piece with stand is what you are buying. 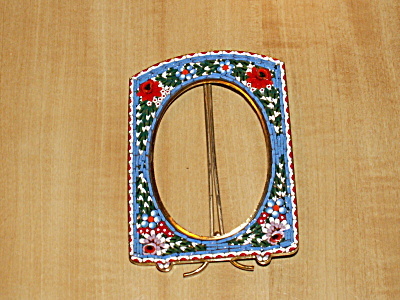 For inserting another very thin glass piece or back cover, the oval opening from the backside measures about 3 1/8 inches in greatest height x 2 1/8 inches greatest width. Without the back piece, there is no indication of who made this or where. From other similar frames we have sold these were often made in Italy so we believe that is also the case here. From the style we believe this to be an antique piece from the early 1900's, although it is possible this may be a few years younger and thus be "vintage", we are not experts. We've provided 8 images to try and show detail. Please note that the camera light reflects off the glass tiles blanding out some of the detail and creating white "hot spots", so we also included one image shot without the light (but this, of course, appears darker). The camera light also lightens the blue background color quite a bit. In person you will see a blue color closer to that of the image shot without the camera light (with this appearing a bit lighter or darker depending on the lighting in your room, of course). Please use the zoom feature to examine closely. This piece will look much more impressive in person than we could show in the images, but they provide a good idea. Wonderful antique condition to the mosaic tiles, but missing the back brass cover and thin clear glass front cover, as stated prior, and with some other expected age/wear. All the mosaic tiles seem to be present and in terrific shape as far as we can see, with excellent color. The brass base piece itself shows light discoloration/wear, along all edges and on the back side via spotting, scuffing, a general light worn look, etc., but no major darkened lines (there is one tiny dark spot on the back of the frame). We don't know if any of this would clean or shine off, we haven't tried, and are selling as is/as found. 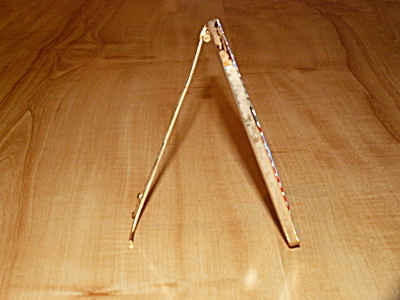 The back leg is straight and supports the frame fine.